Objective: To study the immunological profile, disease characteristics and socioeconomic status of a population of patients with rheumatoid arthritis (RA) in Sri Lanka. Methods: A case-control study was undertaken to characterize the immunoglobulin profiles of 105 RA and, age and gender matched osteoarthritis (OA) patients (n = 30) from the National Hospital, Sri Lanka. Healthy, non-arthritic indi- viduals (n = 30) served as controls. Sera were assayed for immunoglobulins [IgG, IgM, IgE and IgA isotypes] by establish- ing sandwich type ELISA. IgM, IgG and IgA rheumatoid factors (RFs) of 162 RA patients were assayed by indirect ELISA. Disease characteristics and socioeconomic factors were accrued via an interviewer-administered questionnaire. Results: Higher IgG, IgM, IgE, IgA and lower IgG1, IgG2 levels were observed in RA sera compared with controls (P < 0.05). Novel correlations between disease characteristics and immunoglobulins, as well as group-specific corre- lation matrices of immunoglobulins and RFs (P < 0.05) of seropositive and seronegative patients, were found. Higher IgM-RF and IgA-RF levels in seropositives and IgG-RF in seronegatives were evident compared with controls (P < 0.05). Immunoglobulin and RF profiles did not reflect gender disparity of RA (P > 0.05). Proportions of seropositives with nodules and erosions were significantly higher than seronegatives (P < 0.05). While IgM-RF and erosions posi- tively correlated in the seropositives (P < 0.05), the seronegatives showed an inverse correlation between IgG-RF and erosions (P < 0.01). Familial clustering imposed a relative risk of 4.7 for developing seropositive RA. Conclusions: This model study provides baseline information on pathogenetic aspects of RA in Sri Lanka, which may have implications for further research on management of the disease. Introduction: Various factors are known to determine the disease activity in patients with rheumatoid arthritis (RA). The main objective of this study was to establish the validity of the new tool of measurement of disease activity, Simplified Disease Activity Index (SDAI), in patients with RA in Indian population. 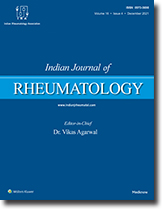 Methods: All patients with RA fulfilling the ACR classification criteria attending the rheumatology clinic at Nizam's Institute of Medical Sciences, Hyderabad over a period of 3 months were included in the study. A detailed assess- ment of each patient including their demographic characteristics, duration of the disease, number of tender and swollen joint counts, Westergren's ESR and C-reactive protein (mg/dL), patient's and physician's global assessment by VAS (0-10) were recorded. DAS28 and SDAI were calculated for each patient. Statistical analysis was done. Results: Two hundred and sixteen patients were included in the study comprising 184 women and 32 men. Mean age of the patients was 42.94 ± 11.23 years and mean duration of disease was 4.10 ± 4.02 years. Mean DAS28 and SDAI were 5.19 ± 1.48 and 24.2 ± 16.06 respectively. ROC curve revealed that discriminative ability of SDAI was better than that of DAS28. The optimal cut-off points for treatment changes were 4.46 for DAS28 (sensitivity 88%, specificity 87.5%) and 12.6 for SDAI (sensitivity 92%, specificity 83%). Conclusion: SDAI is a valid tool for measurement of disease activity in RA in Indian population and is as good as DAS28 in its ability to assess the patient's status. Remission is the goal of treatment of rheumatoid arthritis today. However, no satisfactory definition of remission is available. A number of definitions have been used, viz. ACR, FDA, DAS, SDAI, CDAI, Clin28 (and Clin42), RAPID3 and Physician Global Assessment. FDA's definition is the most stringent definition currently because it demands not only the fulfilment of ACR criteria but also evidence of radiographic arrest by Larsen or modified Sharp's index while off all antirheumatic therapy. While DAS and its modifications require a computer software or a programmed calcula- tor, CDAI avoids this requirement altogether. A serious drawback of all current definitions is the presence of residual disease activity in a significant proportion of patients meeting the criteria of "remission". It appears that most defini- tions of remission identify a state of minimal disease activity (MDA)-a concept initially proposed by an OMERACT committee. Recently, it has been shown that a large proportion of patients deemed to be in clinical remission have evidence of active, ongoing disease process as revealed by MRI or ultrasound-power doppler studies. Perhaps, the best approach would be to aim at achieving a state of MDA first and then performing imaging studies to look for evi- dence of subclinical disease activity. If necessary, treatment should be escalated so that silent damage is prevented and deformities averted. Giant cell arteritis (GCA) is probably the commonest type of large-vessel vasculitis seen in the United States (with a possible involvement of medium-sized vessels as well). The exact etiopathogenesis of GCA is still not fully understood. Clinical manifestations of GCA can be vast and confusing. Up to 22.5% patients may have a 'normal' erythrocyte sedimentation rate (ESR) before treatment. Early detection (with a high index of suspicion) with early initiation of treatment can be 'sight as well as life saving'. Treatment should not be delayed until the results of a temporal artery biopsy are obtained. Newer radiographic techniques including color-Doppler ultrasonography and contrast enhanced 3T MRA may facilitate/increase the yield; and may even obviate the need for a temporal artery biopsy (especially because temporal artery biopsy can be 'read as negative' in a significant proportion of cases). Some recent advances in genetics, pathophysiology, treatment and outcome are also reviewed in this article.